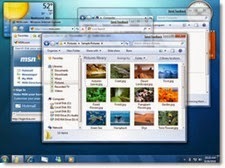 Windows 7 introduced several new power saving measures, in order to extend battery life of your laptop. One very visible feature is the way the laptop screen dims after a set period of time. These power saving features have been further improved upon in Windows 8. Windows 8 or Windows 7 extends battery life for your laptop with an Adaptive Display Brightness feature. This feature, automatically dims the display on you laptop, when it notices that your computer has not been used for a while or after a set period of time. This is similar to what most cell phones do.